Michael Maze is a former professional table tennis player from Denmark. His strength is in his strong forehand loop and lobbing. He is currently considered to be the best, defensive lobbers in the world. His strong forehand loop, his forehand pendulum serve, and his confident defensive play away from the table make him a top world class player. Maze currently uses a Butterfly Timo Boll Spirit Blade with Butterfly Tenergy 05 on the forehand and the backhand. He changes the rubber every 2 weeks. I hope that he will come back because table tennis is such a great sport! Yes, Maze has a really good service receive skills. Pro players train 6-7 h daily until they master the skill. But don’t worry! 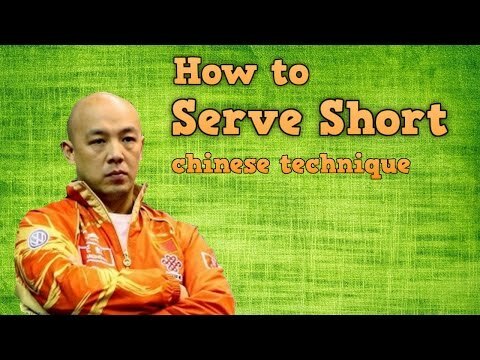 I will give you 3 tips to return the sidespin serve correctly. If you don’t know, why top players prefer doing the sidespin serve, watch this video for the real reason. Tip 1: To keep your return short, you should contact the ball in the early timing. At the position 1 to 2 timing. If you hit the ball late, it’s very difficult to keep your return low, and short. So the opponent will attack your return easily. Here are the timing position: from 1 to 5. I’ve explained the “hitting timing” in a previous PingSunday video. Search “Optimal timing table tennis” to watch it. So you should contact the ball at position 1 to 2. Well, you know what, sidespin ball has a lot of energy. So to return it short, you need to absorb energy, otherwise, you can’t return it short correctly. But how? I’ve explained the PingSunday video, named “Contact Point in Table Tennis”. To absorb the energy of the service, you need to hit the ball, near the handle of your racket. Here, at the position (1,2) and (2,2). Because the velocity of your racket at this position is minimum. So your return is less affected by the spin. Let’s see it with Michal Maze’s contact position. Can you see it? Yes, great! OK! Tip 1 and Tip 2 is the easiest one. But the last tip is very difficult for the new players. So please concentrate right now, because this one will decide the quality of your return. Well, Chinese coach says “You can return every ball short, no matter how much spin on the ball”. Yes! but the problem is you must hit “on” the rotation axis. If not, you will “eat” the spin of the ball. On the rotation axis, there is “no rotation”, “no energy”, right? Look at here, it’s on the North, and South Pole of the globe. So imagine is the incoming ball with pendulum sidespin. So hit the ball, at on the bottom back. Here, on the rotation axis. So you won’t “eat” the spin. The last skill is the hardest. To learn this feeling, practice a lot, and you can realize where is the rotation axis of the ball. Hope you improve your table tennis skills every day! And don’t forget to support my channel (share, comment, and offer me a coffee, if you like). I’m EmRatThich, see you again.